The key to ProCredit’s success is our employees, who put our positioning and philosophy as a “Hausbank” for small and medium-sized business into practice. Responsible financial intermediation requires staff who are able to establish long-term relationships with our customers, analyse credit risk reliably and provide good service in a competent and responsible efficient manner. Our investment in training over the years and the resulting ability to respond quickly to changed circumstances has placed ProCredit in a strong position to adapt effectively to the more volatile operating environment which generally prevails in emerging markets, and particularly following the financial crisis. 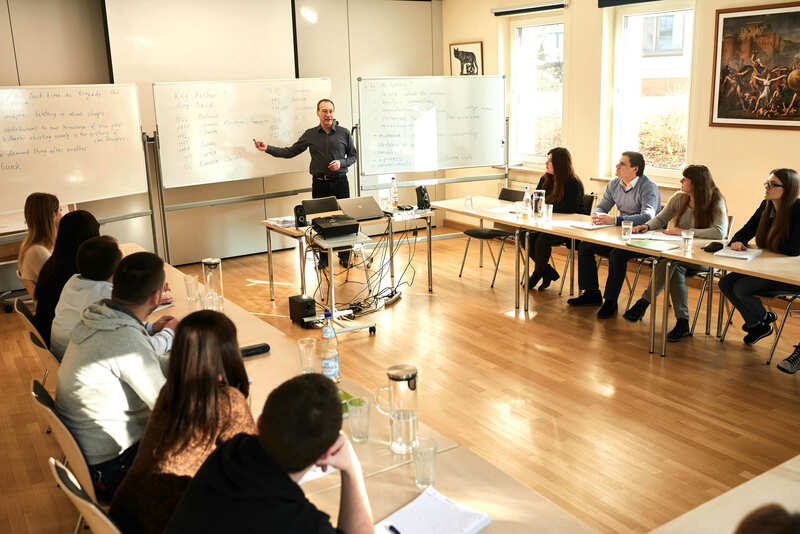 Given the demands we place on management staff and the specialists who serve our SME clients, much attention is focused on appropriate training, provided, in particular, through our two-tier academy programme in Fürth, Germany. The first level of the Academy consists of a one-year part-time course, the ProCredit Banker course. This programme is open to all interested employees and aims to bring together competent specialists and potential managers to learn and actively exchange their views on the company vision and business strategy. This programme is also the prerequisite for the ProCredit Management Academy as participants with the highest potential for further development will be selected to continue with the three-year course. Over the years, the ProCredit Academy has aimed to train all interested staff, Business Client Advisers, Client Advisers, Credit Risk Analysts and head office specialists. Staff members are selected for participation based on their bank’s assessment of their performance and personal development to date. Since the participants include staff from each ProCredit institution, students have the unique opportunity to undergo intensive training with peers from different cultural backgrounds over a one-year period. The ProCredit Banker Academy is a key component of the graduated ProCredit training programme, which begins with the ProCredit Onboarding Process, continues through advanced courses for existing staff and – for a select few – culminates in attendance at the ProCredit Management Academy. As well as fostering the personal and professional development of promising employees who identify with us and want to advance, the Banker Academy also serves to identify ProCredit staff with strong management potential and prepare them for participation in the three-year intensive course at our Management Academy. are convinced that building long-term relationships with SMEs is the most effective method of promoting job creation and economic growth. Discussion of this business philosophy beyond the managerial level is essential. Within this context, the ProCredit Banker Academy plays a fundamental role in overseeing and pursuing this discussion on a broader basis and contributes to the creation of a common understanding of how our group defines ethical banking. The ProCredit Management Academy with its three-year programme has been in operation since January 2006. The significance of this academy, which is the central component of a graduate training programme for ProCredit staff, can only be fully understood if one takes into account the special nature of the ProCredit banks and their parent company, ProCredit Holding. What makes them special has both a formal and a practical dimension. All of our managers have graduated or are currently attending the ProCredit Management Academy. The Academy, however, is not positioned as an elite school for the formation of a management cadre, as it offers the opportunity for personal and professional development to a broad group of employees. This inclusiveness should not, however, cause anyone to lose sight of the high standards that the students are expected to meet in terms of performance and commitment. Bearing in mind that our group of banks has evolved out of a commitment to development aims, and that this idea has taken on different concrete forms in different countries, it becomes obvious just how much the group depends on the local staff members who represent that idea in their respective countries. The corporate culture of the Academy can be summed up in the concepts of tolerance and curiosity, rational thought and scientific method, solidarity and friendliness, values and principles. The Academy brochures provide more information on the philosophy of the Academy and course content.